This works really well. The only con is you have to remember to use it. Lol! 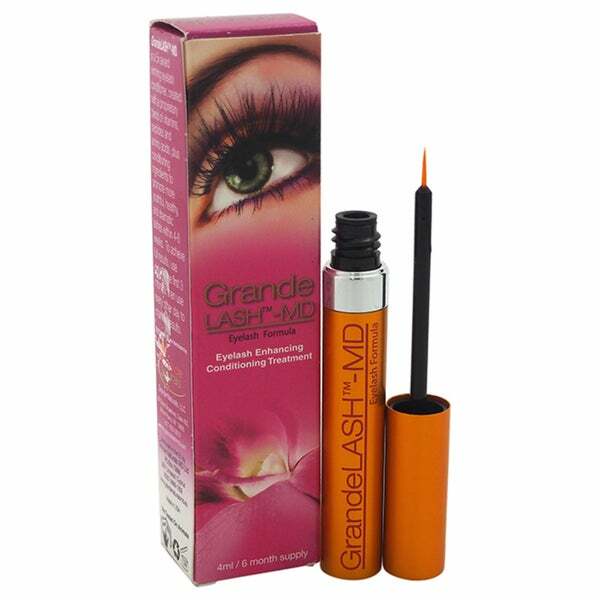 Thicken and darken your eyelashes for a bold look with GrandeLash MD eyelash formula mascara. Fruit extracts and silk amino acids help boost the look and health of your lashes for stunning results. Great deal. 6-month supply for the price of one. Real GrandeLash Eyelash Serum, packaging and labeling are exactly like the ones at Sephora. I had almost no lashes and after a month of using GrandeLash MD, I only need one coat of mascara, my lashes are so long I cannot believe it! At 50 years old my lashes had thinned. I was a Latisse user but my sister suggested this product. Me started with the 2oz to see if it actually worked. I was pleased with the results and when it was time to reorder I opted for the 4oz. I really like the applicator in the tube delivery as opposed to the Latisse delivery option. 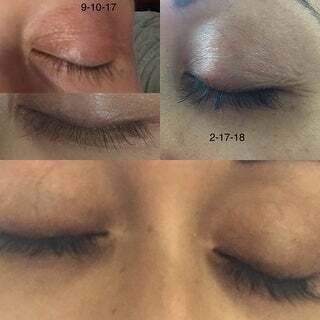 I've been using GrandeLash MD for about 6 months and am happy with the results I am getting with my lashes so recently purchased the 6 month supply. I have tried multiple eyelash products in the past, and have had varying degrees of luck. I do find that this one helped with volume and length, when used regularly. Make sure not to use too much of the product, as it will seep into your eyes and make them burn (only did that once!). I did notice that you have to use this every single day to ensure that you see growth and volume over the course of many weeks. If you stop using it, your eyelashes will go back to where they were before use. Overall, I do recommend this product, as long as you have the dedication to use as part of your nightly skincare routine. Once in a while a product actually works exactly as promised and GrandeLash MD is one of them. Since using this formula, my previously short eyelashes have lengthened to the point that several people have asked if I have them woven! I do put it on every night before I go to bed. As I have gotten older my eyelashes started breaking and were very short. Because of my short and sparse eyelashes I tried eyelash extensions. Whether it was the place or me it did not work for me. I was a little worried about using this product at first but decided to try it out. I am so happy I pushed past my hesitation and purchased this product. It really does work, but you do have to use it every day. It took almost two months before my lashes really started to grow, but it has made a drastic difference. I have not had any eye irritation. I also have not noticed any darkening of my eyelid skin or any discoloration of my iris in either eye. I get compliments all the time and many times I’m asked if my lashes are fake. I've noticed my eyelashes don't fall out as much as they used to when I take off my mascara and they' are long and very strong. Very noticeable how my lashes began to grow. At first I thought I a piece of fuss stuck on the end of my lash,then realized it just getting longer. Have been using about 1 yr. Co workers noticed too, thought I fake lashes on ,they are very long when mascara is added. Works great and Overstock has the best price! Oh, I love this product! I used this product last year for 3 months. Family and friends commented on how long and thick my lashes were! Only reason I stopped using it was the price was too much, but I bought it this time because you get a 6 month supply for a great price. This deal is much more affordable! I knew it would do what the advertisement says: your lashes will grow! Secret to this is using it every day, and in a few weeks lashes are longer. Consistency is the key. This product is worth the money! A little hint to make it last: a little goes a long way! I've tried other lash growth products that really did nothing for my lashes. You really have to be consistant, but after a couple months my lashes were super long! I got lash extensions for my wedding but cannot justify the cost of their upkeep. Grande Lash is a great happy medium, and overstock has an unbeatable price. As long as you make this part of your daily routine, you'll have long, beautiful natural lashes. I actually bought this for someone else who wanted this. They seem to like it though I am not sure how long it will take for this to work. I believe it is supposed to work after 3 weeks. Awesome stuff. I wear extensions and my tech tells mey eyelashes just keep growing and getting thicker. Great product. It worked in my eyelashes and brows. This stuff truly works, but it takes time. You will see results in two months so be patient. Keep using it daily to keep your beautiful, long lashes. It also doesn't change your eye color like the other product out there. I still have my green eyes. Love this stuff although I thought this was going to be bigger than the tube I got at the beauty supply for $50, but it wasn’t. It’s the same size. I didn’t have my old one to compare when I purchased. This tiff defiantly helps with growth and breakage it seems that my lashes are fuller. Have to put it on every day though! I previously used NU Lash and it was *** plus a tube and took longer to achieve results that I am having after only one week of using GrandeLash MD. Very pleased at the results and the price!! Received 6 month supply but the expiration date was in 3 months! Overstock did credit me % - but I felt this one never worked like the first one I bought on (which I thought was FABULOUS - worked wonders on my lashes). I did buy again from but I was also disappointed with that. Maybe it only works the first time. I had planned on using this for a lifetime- cannot say how disappointed I am. But again the product did work wonders the first time - my lashes grew and looked darker - now they are back to looking mediocre - guess it was too good to be true!! Amazing results. My lashes went from short and straight to long and curled. Amazing stuff. My lashes are sooo long and full they actually hit my glasses. Love this product. Great. Works as it claims. I love this stuff. "Is this the LASH ENHANCING SERUM?" i Believe so. It is for me. My eyes are sensitive so I can't use it on my lower eyelids. Yes it is and works really well. Yes, it is! It's very good! I've been using it for several months & it's worth it! I get compliments all the time! My lashes look like they did when I was a teenager. "Is it possible that this takes longer than 5 weeks? I haven't noticed any difference except darker eyelids. Hopefully darker lids will also come with longer lashes. A bit disappointed." I would give it two months. I wore extensions and decided to stop. My lashes were non existent. Got this from my aesthetician. Label says it takes longer for older people- it does- but it works! I don't think I saw anything until 2 months in. My lashes are longer and thicker and I get a lash lift every eight weeks. Please be advised that everyone's hair grows differently. My aesthetician is Asian and her lashes are really long after using this - mine are not as long as hers. However, I love them and I don't use the glued extensions anymore. Also, grand brow works too- it does take time. Mine took about 8 weeks to notice a difference but I definitely noticed growth. "Is there any chance that this doesn't work on everyone? I have been using over 3 weeks and haven't noticed any difference." I noticed around 4-5 wks after I started using it. I started just before Thanksgiving and by Christmas I noticed that my lashes were longer than before I had started using it. I have been using this product for more than three years and it works. Before you give up on Grande Lash i suggest you use it as directed for about 4 months. Some people can see results in two weeks while others see it in two to three months. I know this because I have given this as a gift to friends and everybody got results at different times. Please make sure you apply it at night on a clean face after putting whatever product or moisturizer you use specially eye cream/serum. Wait for your products to be absorbed (about 5/10 minutes) and the apply the lash serum at the base of your lash line. I use mine on the top and bottom. If at the end of the 3/4 months you still don’t see any results then I suggest you use Revitalash. Hi Michele, I thought the same thing, but my friend swore by it and said give it 6 weeks....and sure enough, she was right! Her lashes looked amazing, so I started using grade,ash on one eye, just to see if it worked. BAD MISTAKE, bc it does. It just takes a long time. I spent two months trying to get my untreated lashes to match the eye that was tested. Now I only use it once daily, to keep what I have. I use it when I apply my morning moisturizer on bare lashes and let both dry before starting my makeup. I work outside in south Florida as a PE teacher, so I sweat A LOT. it never burns like other brands have when I sweat, and I recently started using their mascara too. I had stayed away from it bc it isn't water-proof and wish I had started using it years ago! I have deep-set eyes and oily eyelids, to the point that waterproof mascara ALWAYS left black shading where my upper lashes touch my lids by noon. Grandelash doesn't AT ALL, and I don't even bother with a primer for Work, due to the nature of my job. I think using the mascara AND the lash treatment compliment each other, so you get more bang for your buck. Don't give up yet....miracles are on the horizon! Hope this helps. Btw, the lash treatment amount does NOT get you through the time they claim it does......so I always buy the larger 4 ml size bc I don't want to be without it. I do not want to endure the initial wait time again. You will need to go through 4 ml before you actually see your maximum results, so stock up while it's cheap on Overstock! "The bottle pictured is different than the one pictured on the Grand-Lash MD website. How do I know that it is the real product, and if it is a real product, not an older version of their current product? Thanks!" Mine was different too, I think the new packaging is gold. I am finding it to work just as good as it did with the old packaging. I too have a different packaging. Previously it was a bright gold brushed vial which I have used and the product is amazing. I just bought the 4.o ml vial and the vial is completely different; it's still gold but darker and not brushed metal like the previous model. I HOPE it is the same product as the one I purchased previously is/was amazing. I will post back here IF the results are different and IF this vial is a counterfeit. I sure hope not; if so I will be asking for a refund. Yes...the new packaging is a gold bottle. I have ordered GrandeLash MD from Overstock several times in the past and received a (brighter) gold bottle. However, I just received a new bottle from Amazon (Overstock was sold out) and it is the same gold that is advertised here on Overstock. By the way, I have pretty much tried every lash growth serum on the market and nothing compares to GrandeLash MD. I absolutely love it. If you are just beginning it will take 6-8 weeks to see results. Patience is a must and be sure to use twice daily to start. Once you get your lash growth, taper back to once a day or even once a day every other day to maintain. Good Luck...hope this helps. "Why is the 4ml size the same size as the 2ml?" To be honest I never noticed the sizes of the tubes. What I can attest to is that the 2 oz do last about two month and the 4 oz six to seven months. I have used this product for a few years and I only buy on Overstock when it is on sale. Can I use this on eye brows? "what is the expiration date on the tube I would receive?" The expiration date on my tube is April 2018. I will also point out that if you receive a beauty product that is, for example, a tube of Grande Lash that is dry when you open it. Overstock customer service is superb and they will do everything they can to fix the issue by replacing the product. I have been Overstock customer for over 10 years and purchase this product regularly.